Application Fee : Rs. 750/- to be deposited in any branch of Indian Bank through a challan or by Online method through Credit / Debit Card. No fee for SC/ST/PH candidates. 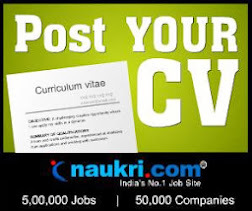 How to Apply : Apply online at KVC website http://jobapply.in/kvs from 29/07/2013 to 28/08/2013. Take print out of auto generated filled in application format and affix their photograph at the appropriate places and put their signature on all pages of the application form. The print out of comple ted application, along with prescribed KVS bank challan where applicable and self-attested copies of testimonials, is to be sent in an envelope after affixing the address label generated alongwith the application print out superscripted "Application for the post of ............................" to " Post Box No. 3076, Lodi Road, New Delhi-110003" by ordinary post only. The application complete in all respects should reach the above post box on or before 12/09/2013. The Online application will be entertained only if the application printout along with the relevant documents is received.